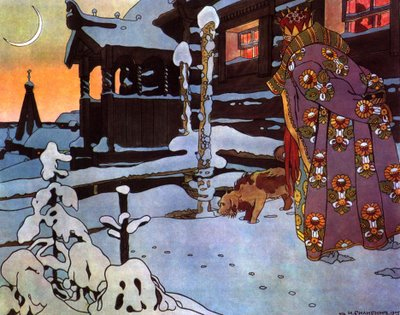 Ivan Bilibin | Ledia Runnels' "World of Fantasy Fiction"
Tsar Saltan, hearing, was silent, thinking of his dead wife and of her promise to bear him such hero-sons. He dismissed the merchants with rich gifts and they bought goods to fill their ships and sailed away again on the wide sea-ocean. In time they touched at the island of Tsaritsa Marfa, and being entertained, recounted to her their visit to Tsar Saltan’s court and told how, for a third time, he had purposed to voyage thither, until his wife had told of the underground room, and of the six Tsarevitches with legs golden, arms of silver, and with stars in their hair. So the Tsarevitch struck together his flint and steel and bade the ax and hammer build a ship which would fly either on land or sea and which should take them to the witch’s forest. Next morning all was ready, and they straightway embarked and sailed over the sea-ocean, and over the open steppe to the edge of the forest, where the Baba Yaga had hidden the stolen Princes. Then Tsaritsa Marfa showed herself, and the six Tsarevitches ran to her, and she took them in her arms and kissed and caressed them and told them who they were-that she was indeed their mother and Tsarevitch Guidon their little brother. She brought them from the forest to the magic ship and it sailed with them like a white swan, over the open steppe and the blue sea-ocean to the Tsaritsa’s island, to her Palace of white stone, and there they began to live happily together. When the merchants spoke thus the wicked wife of Tsar Saltan opened her mouth to speak, but the Tsar rose up and silenced her. “Tell me no more of thy marvels,” he said to her. “What am I, a Tsar or a child?” And having dismissed the merchants with presents, he sent for his Ministers and Boyars and bade a fleet to be prepared, and that same day set sail for the island. 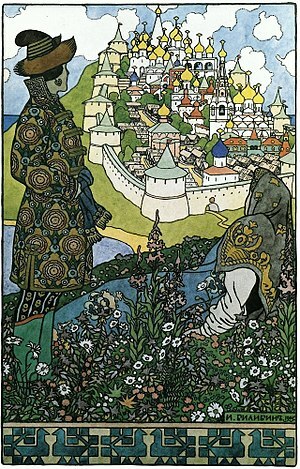 Tsarevitch Guidon, sitting with his brothers at the window, saw the ships of Tsar Saltan coming over the blue sea- ocean, and called to his mother, “See, our little father is coming!” He went to meet him and brought him into the Palace to the Tsaritsa. Seeing her, Tsar Saltan recognized her, and his breath stopped and his face flowed with tears. He kissed her and embraced his seven sons and all began to weep and rejoice together. When they had spent some days in such happiness, they went aboard the ships and sailed back to Tsar Saltan’s realm. He summoned his Ministers and Boyars, his Princes and Judges, and they condemned his evil wife, and she and her sister were put into a chest barred and bound with iron, and the chest was thrown into the sea-ocean. But God did not protect them as He had protected the Tsaritsa and her son, for they sank at once into the lowest abyss and were drowned. But Tsar Saltan and Tsaritsa Marfa, with the seven Tsarevitches, lived always together in bright-faced joy, and increased in all good things. And Tsaritsa Marfa was as beautiful in her old age as she had been in her youth. te price for a deadly rival spawned in the mists time. 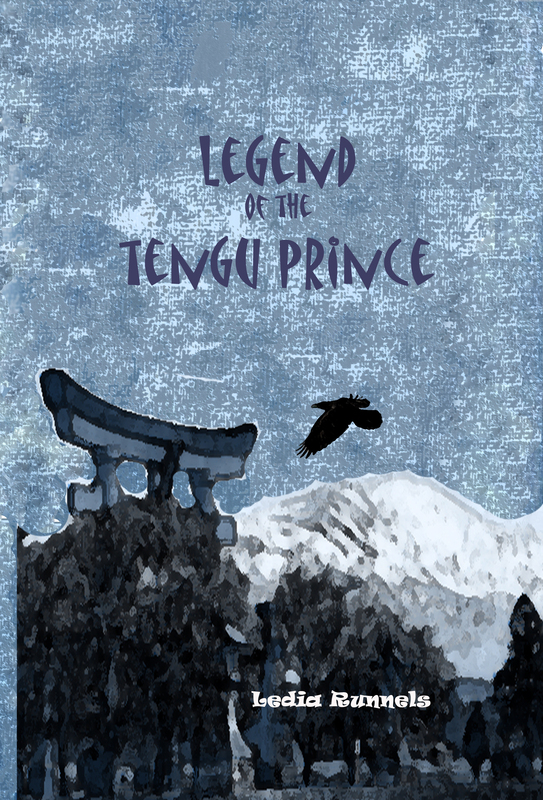 This riveting first volume of a epic fantasy adventure will leave you stunned and begging for more. “What is that?” asked the Tsar. And, deeming this an even greater marvel, Tsar Saltan again laid by his purpose to visit the island. The merchants filled their ship with new merchandise and set sail for distant lands and, passing the island again, were welcomed by Tsaritsa Marfa and Tsarevitch Guidon, to whom they recounted their visit to Tsar Saltan. Nor did they fail to tell how he had purposed to sail thither until he had heard of the fir tree, the squirrel and the nuts of gold and emerald. The ax and hammer disappeared and next day, when he arose, the Tsarevitch found all done as he had commanded. He bade them build a summer-house of crystal for the squirrel to live in, and the golden shells and emeralds he put into the Palace treasury till the wealth could not be reckoned. Hearing of this new wonder, the Tsar gave up his purpose to visit the island. 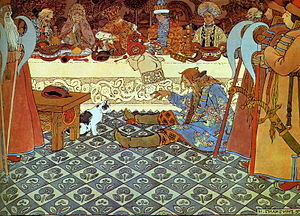 The merchants, having loaded their ship with other goods, sailed on a second voyage, and, passing the Tsaritsa‘s island, cast anchor, and were again entertained; and they recounted there how Tsar Saltan had desired to sail thither till his wife had told him of the mill, the golden column, and the story-telling cat. At once the ax and hammer disappeared, and, next morning, when he went to his balcony, the Tsarevitch saw that the gardens the mill, the golden column, and the clever cat bad all been brought as he had commanded. He caused his servants, the ax and hammer, to build by the column a crystal summer-house, in which the cat should live, and each day the Tsaritsa and Tsarevitch Guidon amused themselves by listening to its songs and stories. Now, before many days it befell that a ship came sailing that way, and the shipmen wondered greatly to see there, on what had been an uninhabited island, a stately Palace, with golden domes and walls of white stone, and they landed to see this marvel. The Tsaritsa met them and made them her guests, giving them food and drink to their hearts’ desire. Tsar Saltan wondered greatly to hear, and said: “As God lets me live, I will visit this wonderful island and see it with my own eyes.” But his wicked wife, not wishing him to go, began to sneer. “What marvel is that?” asked the Tsar. The messenger delivered the letter, and at once the Boyars came to the Tsaritsa and told her the cruel decree. They pitied her and wept with her, but there was nothing to be done, since the Tsar‘s will was law, and the same day, with the babe still hidden in her sleeve, she was put into a chest bound with iron, and it was thrown into the wide sea-ocean. Soon after, the Tsar returned, ready, so great was his love, to forgive his wife a third time. But it was then too late, and, thinking that the Tsaritsa was drowned, he at length married the elder of the two sisters, and brought them both to live in his Palace. Whether the chest floated a long time or a short time in the sea-ocean, on smooth water or rough water, the little Guidon, who had been hidden in the Tsaritsa’s sleeve, was growing like wheat-flour when new yeast is added to it, not by days but by hours, until at length he began to speak. She gave him permission, and he began to stretch himself, and so strong and sturdy was he that the iron bands broke asunder and the chest fell to pieces. Looking about them, they saw that they were on an island, which had a high hill, sloping down to a green field, surrounded by a forest. The mother and her son crossed the field and entered the forest, searching for a path that should lead them to some habitation. They found none, however, and were about to return wearied to the meadow, when Tsarevitch Guidon came upon a purse lying on the ground. Opening it, they found a flint and steel, and were glad, thinking that with a fire they could protect themselves against cold and wild beasts. Tsarevitch Guidon struck the flint and steel together, when instantly there appeared a sharp ax and a huge hammer. At once the ax flew at the trees and began to chop, square, and sharpen them, and the hammer to pound them into the earth for a foundation; and while the Tsaritsa and the Tsarevitch watched, there began to rise on the edge of the forest a Palace of white stone, with battlemented walls, more splendid than has ever been seen in any Tsardom, richer than can be guessed or imagined, whose like can neither be told in a tale nor written with a pen. They entered it, and found therein whatever the soul could ask. When the messenger brought him this message, the Tsar‘s anger waxed hot. He ordered the puppies to be thrown into the sea–ocean, and would have slain his wife but for his great love. However, after his anger had softened, he said to him self: “This second fault also I will pass over. Perchance even yet she will bear me sons fit for a Tsar.” And, returning to his capital, he lived happily with her as before. 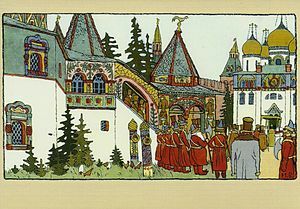 It happened at length that the Tsar went to a distant Tsardom to pay a visit of ceremony, and this time he set a strong guard about the Palace, with strict command to allow no one whatever to go in or out. When he had been absent six months, two more babes were born to the Tsaritsa-sons of a loveliness that is known only in a tale, with legs golden to the knee, arms silver to the elbow, and with little stars in their hair. And the Tsaritsa, deeming herself safe by reason of the guard about the Palace, bade them peal all the bells for joy. When the Tsar heard this message, he well-nigh lost his senses in the violence of his rage. After his anger had some what subsided, he ordered the log of wood to be thrown into the sea-ocean, and sent a letter to his Prime Minister, bidding him call together his Boyars and Princes of all the Realm to consider the matter on his return. It befell when the Tsar had been three months absent that three babes were born to his Tsaritsa-such lovely little sons that their like cannot be told or described, but can only be imagined, and each had legs golden to the knee, arms silver to the elbow, and little stars in his hair set close together. And Tsaritsa Marfa sent to her husband a fleet messenger to tell him of their birth. Then they bribed the nurses and attending women, took from the Tsaritsa, while she slept, the three boy babies, and put in their jeweled cradles three kittens. As for the beautiful children, they gave them to a Baba Yaga [Witch Grandmother], and the cruel old witch put them into an underground room, in a forest, under a crooked oak tree, whose entrance was closed by a great flat stone. He returned at length to his Tsardom, and lived with his wife happily as before, till there was held a great hunt on the open steppe [plain], and he rode away to kill wild geese and swans. And scarce had he been gone three days, when two more sons were born to his wife, the Tsaritsa Marfa-such lovely babes that one could not look sufficiently at them- and each had legs golden to the knee, arms silver to the elbow, and little stars in his hair clustering close together. The Tsaritsa sent in haste for a nurse, and the servant, as it happened, met on his way the old witch. “Where dost thou haste so fast?” she asked him. “Take me as nurse,” commanded the witch. In ancient days, long before our time, in a certain Tsardom of a realm far beyond the blue sea-ocean, there was a Tsar, young in years, named Saltan, who was so hand some and so clever that songs were sung and tales told of him, and beautiful maidens everywhere dreamt of him at night. Minded to rule his Tsardom well, he used to wander forth at dusk in all four directions of his capital, in order to see and hear, and thus he perceived much good and much evil and saw many strange sights. One evening, as he passed the house of a rich merchant, he saw through the window three lovely damsels, the merchant’s daughters, sitting at their needlework, and drawing near he overheard their conversation. Tsar Saltan, listening, was well pleased with this speech. 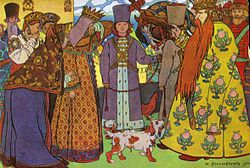 “Glad would I be to be the father of seven such sons,” he said to himself; and returning to his Palace, he summoned his Boyars [Noblemen] and Court Ministers, and despatched them to the house of the merchant to bring his youngest daughter, whom he purposed to make his Tsaritsa. He ordered a great festival and spread tables of oak, at which all the folk of the Tsardom ate, drank and made merry. On the third day he and the merchant’s daughter were married, and slept on an ivory bed, and began to live together, soul with soul, in all joy and contentment. The two elder daughters of the merchant, however, were envious; one sulked over her oven and the other wept over her loom, and both hated their sister because the Tsar had preferred her over them. Now there was war in those days and whether after a long time or a short time, it became necessary for Tsar. Saltan to take the field. Tsaritsa Marfa wept long and would not be comforted; so before he departed he sent for her two sisters to remain with her until his return. And they, although they hated their sister, pretending great love for her, came at once to the Palace. So the Tsar mounted his good horse and bid ding his wife care for herself for his sake, rode away to the fight. “What a fool is this girl!” thought the Tsar‘s daughter. “Presently I shall have all her possessions and Finist the Falcon for my husband into the bargain!” So she assented gladly and when Finist the Falcon fell asleep that night, for the third time she put into his hair the enchanted pin and brought the girl into his room, bidding her give over the golden plate and the diamond ball, and keep the flies from him till daybreak. Through that long night also the merchant’s daughter bent over her loved one, weeping and crying: “Finist, my own dear, my bright Falcon with colored feathers, awake and know me! I have worn through the three pairs of iron shoes, I have broken to pieces the three iron staves, I have gnawed away the three stone church-loaves, all the while searching for thee, my love!” But by reason of the enchanted pin, although he heard through his sleep her crying and lamenting, and his heart grieved because of it, Finist the Falcon could not waken. So at length, when day-dawn was near, the girl said to herself: “Though he shall never be mine, yet in the past he loved me, and for that I shall kiss him once before I go away,” and she put her arms about his head to kiss him. As she did so, her hand touched the pin in his hair and she drew it out, lest by chance it harm him. Thus the spell of its enchantment was broken, and one of her tears, falling on his face, woke him. And instantly, as he awoke, he recognized her, and knew that it was her lamenting he had heard through his sleep. She related to him all that had occurred, how her sisters had plotted, how she had journeyed in search of him, and how she had bought of the Tsar’s deceitful daughter the three nights by his side in exchange for the silver spindle, the golden hammer and nails, and the diamond ball that rolled of itself. Hearing, Finist the Falcon was angered against the Tsar’s daughter whom he had so nearly wed, but the merchant’s daughter he kissed, and turning into the Falcon, set her on his colored wings and flew to his own Tsardom. And so did Finist, the bright Falcon with colored wings.